La Belle Assemblée, September 1814. I have never been sure why this dress is called the Pamela Evening Dress. In the General Observations on Fashion and Dress in this same issue of the magazine there is mention of “elegant walking bonnets à-la-Pamela.” Who was Pamela? The description, below, spends so much time praising Mrs. Bell on her Circassian corset that the full evening ensemble gets only scant attention. No mention at all of the head-dress. The whole outfit looks almost more like a walking dress than an evening dress, though the lace pelisse would likely have made it very grand. “Frock of finest India muslin, body and sleeves of lace; the former made full, and the latter the triple epaulette, which is composed of three folds of lace. 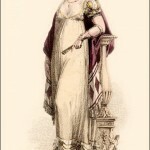 Over this dress a superb white lace French pelisse, lined with sarsnet–colour maiden’s blush, and made and trimmed in the most elegant manner. We forebear to enter into the minutia of its form as its general effect is well preserved in the Print; and ladies who may wish to inspect the original will, we are convinced, find it the most becoming and elegant pelisse that has yet appeared in the circles of fashion. 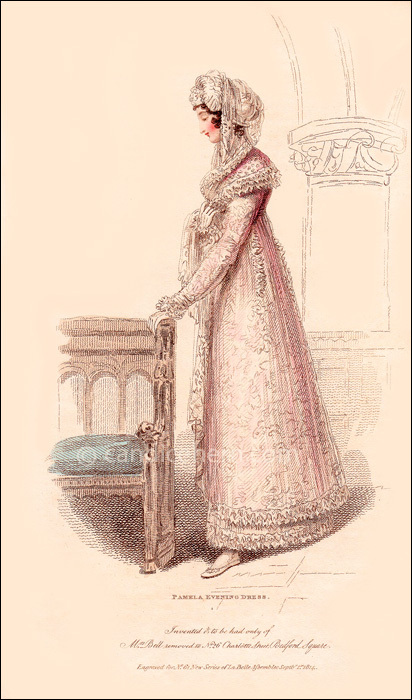 This dress is intended to represent a lady in the Circassian corset, which continues in the highest estimation; it might indeed be termed, with the greatest propriety, the corset of the Graces, since nothing can display a fine form to so much advantage. 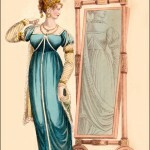 it is nut justice to Mrs. Bell’s taste to say that she deserves the greatest credit as the inventress of two corsets so well suited to every stage of life, and so admirably adapted to display to advantage the slight of the full proportioned female figure; nor can our fair readers forget the improvement in their beauty which must result from wearing a corset so conducive to their health. Adieu to steel busks, long stays, and al the torturing compressions under which British beauty has so long laboured; the Circassian and the Wellington corsets have, and we cordially hoped forever, banished them.